The North America Procurement Council (NAPC) has formed a partnership with Nasdaq's Globe Newswire. Relied on by financial and business media as a major source for news stories, GlobeNewswire, a Nasdaq company, is one of the world's largest newswire distribution networks, specializing in the delivery of corporate press releases financial disclosures and multimedia content to the media, investment community, individual investors and the general public. 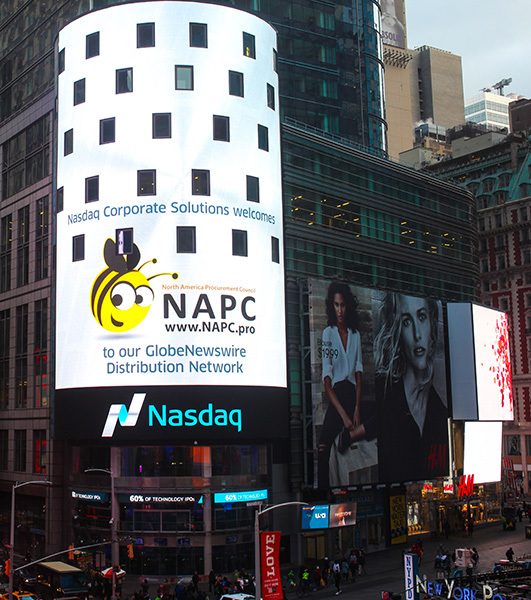 NAPC logo on Nasdaq Tower in Times Square, New York City, to announce the partnership. Select GlobeNewswire press releases now go into the NAPC news database and relevant press releases are processed for news articles and distributed through corresponding NAPC portals. Starting in March, the entire GlobeNewswire newsfeed will be accessible through the NAPC Advanced News System to Silver, Gold, Platinum and Platinum+ members. This new partnership will provide NAPC members with greater access to important news and provide Nasdaq’s clients access to a wider business audience. In addition to monitoring press release services such as GlobeNewswire, the NAPC News Team tracks thousands of corporate web sites and other media for important business news. Our writers also conduct research, do interviews and write original articles on important topics. In 2016, the NAPC will expand its news operations and will be seeking more contributing authors. Our news pages will get a new look with more images and a more mobile friendly format.